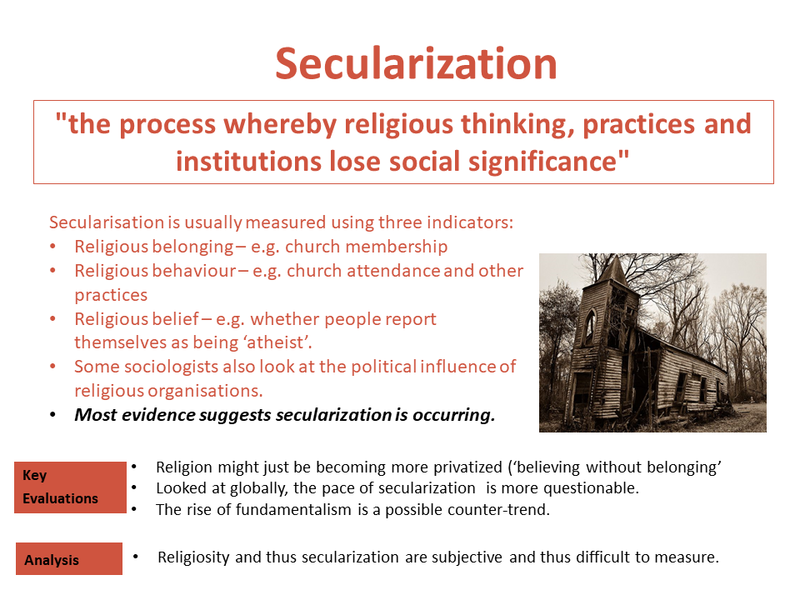 Home / Sociological concepts / What is Secularization? A simple definition of secularization is the declining importance of religion in a society. Wilson (1966) defined secularization as “the process whereby religious thinking, practices and institutions lose social significance”. The power and influence of religious institutions in society – e.g. how much of a say do religious leaders have in making political decisions in a nation state. The strength of religious beliefs within a society – e.g. how many people believe in some kind of concept of God or an afterlife. As can be seen from the above indicators of secularization, measuring the significance of religion in a society, and thus measuring its decline (or otherwise) is far from simple: not only do you need to decide which indicators to use to measure each of the above ‘aspects’ of religion (at the institutional, behavioural and personal-belief levels), but you also need to decide on the relative importance of each of these in determining the social significance of religion. On top of this, further problems in measuring the nature and extent of secularization lie in the fact that measurements have to somehow take into account the fact that religion does not stand still: it has changed considerably over the last 100 years or so. Finally, sociologists need to decide how far back they go, or what the most appropriate time scale is to make a judgement as to the nature nature and extent of secularization. A fuller definition of secularization is provided by Steve Bruce (2002) who defines secularization as a “social condition manifest in (a) the declining importance of religion for the operation of non-religious roles and institutions such as the state and the economy’; (b) a decline in the social standing of religious roles and institutions; and (c) a decline in the extent to which people engage in religious practices, display beliefs of a religious kind, and conduct other aspects of their lives in a manner informed by such beliefs’. Professor Steve Bruce, aka Brucey Baby*, not be confused with Steve Bruce, manager of the football club Aston Villa (or to be confused with either Bruce Dickinson, lead singer of the heavy metal band Iron Maiden, or Bruce Forsyth, recently deceased host of both ‘Play your Cards Right’ and ‘Strictly Come Dancing’), is worth a mention as he is one of the main historical contributors to the ‘secularization debate’. Previous post: Nevis: A Tax Haven Preventing Positive Globalization? Next post: Is it OK to laugh at women who wear the burka?